Have a News Tip ? The compact pickup truck has now gone the way of the dinosaur, the dodo bird, and the saber-toothed tiger. Yes, we still use the phrase “compact pickup” and we still have trucks that we know are not full-sized. But they are no longer small. Trucks like the Chevy S-10, Mazda B2000, and Isuzu P’up, were downright petite. They’re also downright gone. Manufacturers have come to realize that trucks are meant to be trucks, not cars with a really long, flat back seat. So now we have the midsize pickup. Trucks that can really no longer be called compact, but are still not the beasts that full-size trucks are. Information from Car and Driver, Consumer Reports, Edmunds, and Motor Trend, has helped us give you the list of the best midsize pickup trucks for the 2010-2011 model years. 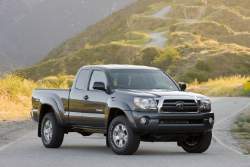 The base price will get you the 2.7L four-cylinder engine, which is acceptable if you’re not doing much hauling or extensive towing, but most will want to kick up to the 4.0L V6 in the Tacoma. It tops the list here thanks to a nice combination of adequate power, modest comfort, and user-friendly amenities. Controls are intuitive and easy to read, while rear space in the Access Cab and Double Cab are ample. 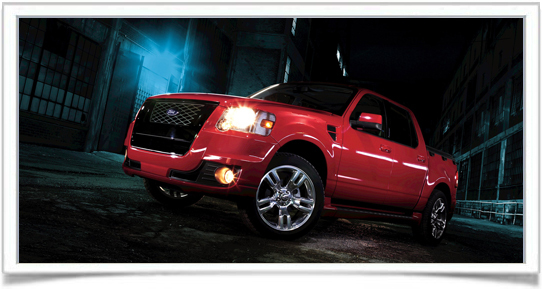 It delivers a reasonably comfortable ride on the road, but rough terrain is where it is most comfortable. Four-wheel drive is available and towing capacity can hit 6,500 pounds when properly equipped. Not overly flashy, but definitely a reliable midsize pickup. The Dakota would actually be at the top of this list were it not for the elevated price. The 3.7L V6 comes standard, with the 4.7L V8 being optional. You can opt for the larger engine with four-wheel drive if you want to increase towing capacity to 7,200 pounds, but you’ll drop fuel efficiency down to a meager 14/18 mpg (city/highway). Other than the price and the lack of fuel economy, the Dakota is admirable in every other category. Off-road abilities resemble that of a mountain goat, and the interior is at least comfortable, though not spectacularly lavish. As a workhorse though, this one leaves other midsizers in the dust. The Sport Trac is an odd animal. It resembles an SUV that somebody cut the rear-end off of and attached a small pickup bed. It’s not big enough or powerful enough to be considered a full-size truck, yet not roomy enough to be an SUV. As such, we’ll throw it in the midsize truck class and give it its proper dues. Like the Dakota, it also features the choice of a V6 or V8 engine and two or four-wheel drive. Properly equipped, it can tow up to 7,160 pounds, which puts it right in line with competitors in this class. The cabin is virtually identical to the standard Explorer, making it one of the most comfortable pickups available. The 4.5-foot utility bed is constructed of a corrosion-proof composite and features a molded liner that will resist scratches and dents. It’s original if nothing else. Though this is another economy-minded midsize pickup, offering the option of a four-cylinder engine, drivers will most definitely want to stick with the 4.0L V6 here. The 2.5L four-banger is all but useless in this truck. The V6, however, is capable of conquering pretty much any task. Properly equipped, towing capacity can reach 6,500 pounds, and acceleration from the V6 rivals many trucks with more powerful V8s. Steering can feel heavy, but remains tight. The interior is the one drawback here; the cabin is cramped no matter which model you choose. If you plan on a fair amount of hauling you’ll want the Sport trim, which offers a spray-in bedliner and movable tie-down system. Search used cars for sale and find the best deals near you at iSeeCars.com. To get a FREE iSeeCars VIN Report for a car, click here.